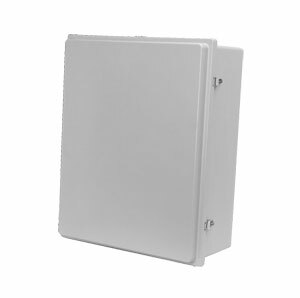 NEMA 4X (IP66) Non-Metallic Fiberglass Electrical Enclosures from 24 x 20" to 30 x 24"
OM-AM Control Series non-metallic fiberglass electrical enclosures are designed to insulate and protect electrical controls and components in both indoors and outdoors applications and are especially well suited for higher temperatures and corrosive environments. These NEMA 4X (IP66) fiberglass electrical cabinets have a raised cover for added depth and a variety of latching options that allow you to provide the level of security or ease of access needed for each application. NEMA 4X Fiberglass Electrical Enclosure with Snap Latches, 24 x 20 x 8"
NEMA 4X Fiberglass Electrical Enclosure with Twist Latches, 24 x 20 x 8"
NEMA 4X Fiberglass Electrical Enclosure with Snap Latches and Viewing Window, 24 x 20 x 8"
NEMA 4X Fiberglass Electrical Enclosure with Twist Latches and Viewing Window, 24 x 20 x 8"
NEMA 4X Fiberglass Electrical Enclosure with Snap Latches, 24 x 20 x 10"
NEMA 4X Fiberglass Electrical Enclosure with Twist Latches, 24 x 20 x 10"
NEMA 4X Fiberglass Electrical Enclosure with Snap Latches and Viewing Window, 24 x 20 x 10"
NEMA 4X Fiberglass Electrical Enclosure with Twist Latches and Viewing Window, 24 x 20 x 10"
NEMA 4X Fiberglass Electrical Enclosure with Snap Latches, 24 x 24 x 8"
NEMA 4X Fiberglass Electrical Enclosure with Twist Latches, 24 x 24 x 8"
NEMA 4X Fiberglass Electrical Enclosure with Snap Latches and Viewing Window, 24 x 24 x 8"
NEMA 4X Fiberglass Electrical Enclosure with Twist Latches and Viewing Window, 24 x 24 x 8"
NEMA 4X Fiberglass Electrical Enclosure with Snap Latches, 24 x 24 x 10"
NEMA 4X Fiberglass Electrical Enclosure with Twist Latches, 24 x 24 x 10"
NEMA 4X Fiberglass Electrical Enclosure with Snap Latches and Viewing Window, 24 x 24 x 10"
NEMA 4X Fiberglass Electrical Enclosure with Twist Latches and Viewing Window, 24 x 24 x 10"
NEMA 4X Fiberglass Electrical Enclosure with Snap Latches, 30 x 24 x 8"
NEMA 4X Fiberglass Electrical Enclosure with Twist Latches, 30 x 24 x 8"
NEMA 4X Fiberglass Electrical Enclosure with Snap Latches and Viewing Window, 30 x 24 x 8"
NEMA 4X Fiberglass Electrical Enclosure with Twist Latches and Viewing Window, 30 x 24 x 8"
NEMA 4X Fiberglass Electrical Enclosure with Snap Latches, 30 x 24 x 10"
NEMA 4X Fiberglass Electrical Enclosure with Twist Latches, 30 x 24 x 10"
NEMA 4X Fiberglass Electrical Enclosure with Snap Latches and Viewing Window, 30 x 24 x 10"
NEMA 4X Fiberglass Electrical Enclosure with Twist Latches and Viewing Window, 30 x 24 x 10"
참고: 304 stainless steel mounting feet included.